Niman Ranch began in 1970 as a small, eleven-acre farm raising humanely treated animals using all-natural feeds. Forty years later, it’s grown into the largest network of independent American farmers, producing antibiotic-free meat products. Niman Ranch began in 1970 as a small, eleven-acre farm raising humanely treated animals using all-natural feeds. Forty years later, Niman Ranch has grown into the largest network of independent American farmers, producing antibiotic-free meat products that carry the reputation of “the finest tasting meat in the world,” and served at high-end restaurants such as Per Se. Paul Willis joined Niman Ranch in 1995 as a hog farmer working to revitalize sustainable farming methods in the Midwest. 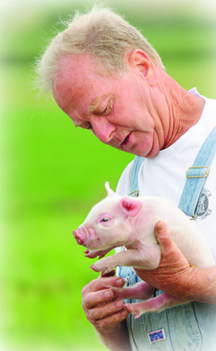 Today, he manages a network of more than 500 family hog farmers, and continues raising his own animals. Fast Company: What’s your definition of sustainable food? Paul Willis: Food that has a minimal impact on the environment and comes from healthy soils, is sustainable, and animals that are raised as humanely as possible and allowed to exhibit their natural behaviors. FC: What’s the biggest challenge facing sustainable food right now? PW: It’s probably the commodity system that is in place, and has been in place for quite a long time, that’s based on high-energy inputs–fuel, chemicals, fertilizers. There are lots of input costs and energy costs. A big obstacle is the food system we have in place. What we need to look for in the future is a sustainable agricultural system where the environmental, social, and economic results are all taken into consideration. It’s not just about yield, it’s not just about dollars, but it’s about taking into consideration long-term goals, and how the system affects the communities, environments. FC: What does Niman Ranch do to tackle that problem? PW: We provide a market for farmers that raise livestock with high animal welfare standards and are generally part of a diversified farm. Most of our farmers don’t just raise livestock, but also raise crops. That allows them to minimize the impact on the environment. For example, the manure can be used as an asset, as a fertilizer, rather than being a waste product. I’m primarily involved with the network of hog farmers. Our criteria, in the briefest definition, are that the animals are raised in pastures or deeply bedded pens. We allow the animals to live in groups with no liquid manure systems, and we pay attention to the natural behaviors of animals. FC: How do we move sustainable food into the mainstream? PW: I think just continue to talk about it, continue to talk about the benefits of supporting farming systems, and ask where your food comes from, how it was raised. Everything from meat products, fruits, vegetables–just be curious. Ask those questions. Support, in the marketplace, what you believe in. FC: How did Niman Ranch become the largest U.S. network of farmers and ranchers? PW: My farm was the first farm in Iowa that was providing pigs to Niman Ranch, which was a brand that has since become the network of farmers–it just came down to the fact that I didn’t have enough supplies, so I just was looking for friends and other farmers that were raising pigs in a similar manner. I created a small network and we just continued to expand. What was happening was, the independent family farmers, without a network like Niman, were just disappearing. There are hardly any today. So we were raising the best pigs and getting farmers the best price. All those things together? It became an important option for people that wanted to stay in business. FC: What are the benefits of choosing your products? PW: It’s the best eating product out there, and it supports small, sustainable farms. It’s raised without drugs, without antibiotics. All those things wouldn’t work if it didn’t taste great, but it does. FC: What did you eat for breakfast today? PW: I had a little bowl of granola that my neighbor made and gave to me. Organic oats, nuts, and fruit.